One of the advantages of tracking data that is updated every week is that you can spot a trend early. Well, February is shaping up to be a rough patch. Perhaps the biggest mystery in economic analysis in the last few years has been trying to find an explanation for the big decline in labor force participation since 1999. A recent NBER working paper by Abraham and Kearney has posited the most comprehensive answer to date. Since it was summarized in this Washington Post article, I'm just going to quote a few paragraphs and suggest that you read the entire article. University of Maryland economists Katharine Abraham and Melissa Kearney built [a method to arrive at a detailed analysis of the data]. 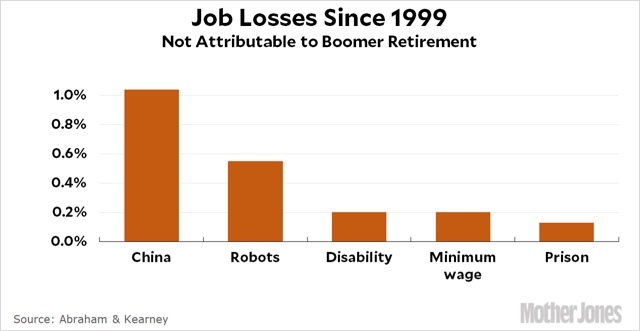 After reviewing the most robust research available and doing some rough-but-rigorous math to estimate how much job loss each phenomenon can explain, the duo discovered something surprising: pretty much all the missing jobs are accounted for. Notably, the authors found that both immigration and the "Mr. Mom" contribution to this number was trivial. One thing I wish they had explored, but I did not see any comment, is the issue of child care costs causing some mothers to decide it would be better to stay at home and raise their children vs. be in the labor force, which I concluded several years ago was probably a much more significant factor. China’s accession to the World Trade Organization in 2001 and its subsequent rise to the top of the global export market. Something tells me that that a lot of those workers who were displaced by China live in places like Pennsylvania, Michigan, and Wisconsin. A big "thank you" to Bill Clinton, Brad DeLong and all of the free-trader Democratic neoliberals for doing their part in the rise of Donald Trump. I haven't been bothering to comment on initial jobless claims reports lately, for the simple fact that every week it's the same story: they're good! In fact, the initial jobless claims reports are probably the single most positive aspect of the entire economic expansion. For all intents and purposes, nobody is being laid off! Note that this frequently but not always happens several years in advance of any downturn. By contrast, current numbers are running on the order of 5% less than last year. One dismissal that it occasionally heard is that the number is bogus because there are fewer "covered employees," i.e., employees entitled to make a claim for unemployment benefits, in this expansion than previously. The number is still at multi-decade lows. but would be more on the order of 250,000 per week than 225,000 per week. Still very good for workers. Conflicting reports on the "rental affordability crisis"
This is a serious real-world issue. I have been tracking rental vacancies, construction, and rents ever since. The Q4 2017 report on vacancies and rents was released a few weeks ago, so let's take an updated look. 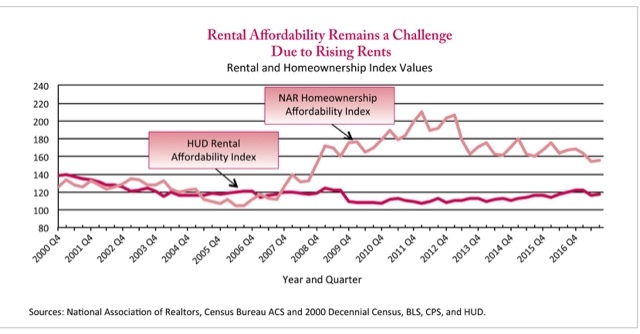 Unlike my calculation above, HUD's shows that rental affordability actually *improved* (!) in 2016, and remained stable in 2017 as the recent spike in rents was more than matched by a big increase in renters' median incomes. Note in contrast that their measure of housing affordability declined a little in 2017, making home-buying the least affordable since 2008, although better than during the bubble years. I'm not sold on HUD's method, mainly because it relies upon annual data released with a lag. In other words, the entire last year plus is calculated via extrapolation. 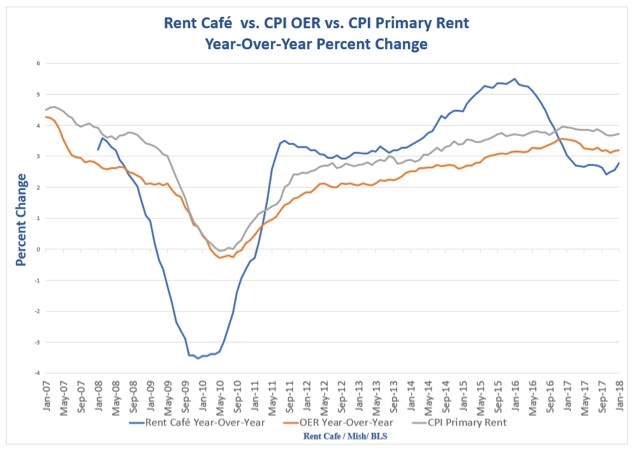 Rent Cafe's measure of rent shows that the surge occurred in 2015 and early 2016, and has abated to less than YoY since, in complete contrast to HUD's and the Census Bureau's data. Parenthetically, now that I have the full history of Rent Cafe's Index, I can follow it monthly, which will make for a much more timely measure than the quarterly Census Bureau report. So unfortunately the conclusion here is messy. This quarter's Census report indicates no relief from the "rental affordability crisis." 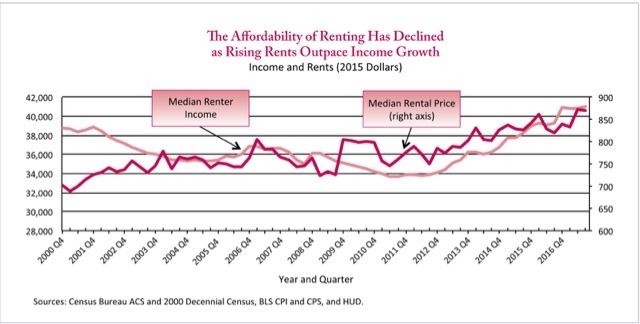 HUD (from the 3rd quarter), shows stability at a level of improved affordability due to income growth, and unlike either of the two government sources, Rent Cafe shows rent increases abating throughout 2017. No, Matt Yglesias, Trump is *not* "probably gonna be re-elected"
While I generally agree with the political and social observations of Matt Yglesias and Ezra Klein, their takes that involve the economy frequently drive me crazy. This is just incredibly shallow analysis and, well, wrong! Presidential and midterm elections are completely different beasts. Midterms are decided by partisan turnout -- people who strongly agree or disagree with the policies that have been enacted as the President's agenda. Presidential elections are primarily (although certainly not exclusively) driven by the strength of the economy. All three were either in or just coming out of recessions during the first two years of their terms. When the midterm elections took place, both real GDP and employment were actually lower than just before Reagan and Obama, respectively, took office. In Clinton's case both were modestly higher. But by the end of their fourth year, when they gained re-election, economic expansions were well in place for all three. All three Presidents were quite unpopular (though not so unpopular as Trump) when the midterms took place. But all three were above 50% by the time they ran for re-election. 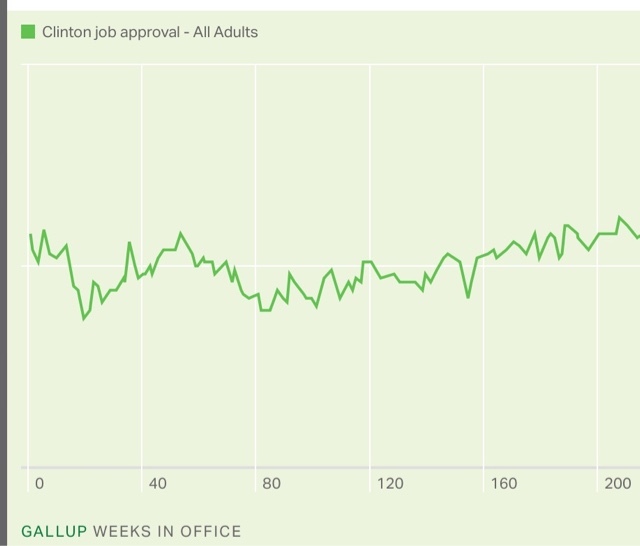 Trump has *awful* approval ratings in the face of an economy that is doing quite well. In fact he has *never* had approval ratings over 50%. While expansions do not die of old age, I would be quite surprised if this one had not faltered by November 2020. His only chance for re-election, in my opinion, is if the Democrats manage to nominate somebody with at least as much baggage as he. 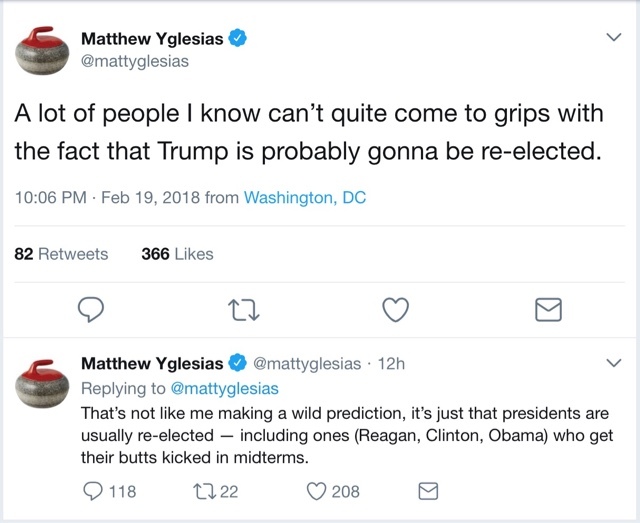 Nobody should be taking any elections for granted, but I see absolutely no basis in fact for Yglesias' assertion that Trump will probably be re-elected. How big a rise in interest rates would it take to create a recession? Based on past experience, how much of a spike in interest rates would it take for the economy to reverse? I lay down markers both in bond yields and the duration of the rise over at XE.com. In the past several years, I have read four biographies of overlooked or more controversial Presidents. On this President's Day, I thought I would briefly discuss each in order of how well I thought they covered their topic. I. "The Man Who Saved the Union: Ulysses Grant in War and Peace," by H.W. Brands. This is one of two recent biographies that have comprehensively rehabilitated Grant, who previously was denigrated as a corrupt drunkard who somehow managed to blunder into winning the Civil War. But when he died in 1885, he was lionized in both the North and South. HIs pallbearers included his Union partner William Tecumseh Sherman and Confederate General Joseph Johnston. Tens of thousands marched in the procession. Grant's tomb is a huge monument along the Hudson River in New York City. Brands shows that while Grant was an incompetent businessman, who probably was cashiered from the army for drunkenness in the 1850s, he was the right man in the right place at the right time in 1861. For Grant had been a quartermaster during the Mexican War, and became a master of logistics. If Lee was the master tactician, then along with Sherman, Grant was the better strategist, starving the Confederate army of industrial supplies and food, all the while relentlessly pushing forward (As an aside, James Lee McDonough's "William Tecumseh Sherman" is also a very good recent biography). When Lee hoped for a Lincoln defeat in 1864, Grant ensured it didn't happen by organizing the first massive absentee balloting, wherein state officials registered and collected ballots from his union armies. His military history of the Civil War, completed four days before his death, is still regarded as a classic and taught at military academies. In peacetime, Grant did his best as both commander and President to carry out Lincoln's vision of reconstruction. To his credit, he was not a racist, supporting the rights of the freed slaves, encouraging the passage of the Fifteenth Amendment securing their right to vote, and fighting the incipient guerrilla warfare of the KKK. He also supported the application for Statehood by the Dominican Republic (then known as Santo Domingo), which the Congress rejected for racial reasons. An excellent book, well worth your effort. The son of the second President. John Adams, John Quincy Adams' boyhood alone was pretty amazing. He witnesses several of the earliest battles in the Revolutionary War, and accompanied his father in the latter's mission to France to secure funding from the monarchy. While in Paris, he was tutored by, among others, several fellows named Benjamin Franklin and Thomas Jefferson. He became fluent in French -- then the language of diplomacy -- and could read and write Latin and Greek. On the voyage home, at age 13 he in turn tutored the first French consul in English. Subsequently he also witnessed the peace negotiations that ended the war, and at age 16 accompanied the first US delegate to Russia as his private secretary. At 17 he was entrusted as a diplomatic courier by Sweden and traveled alone 1000 miles across Europe from Russia to The Hague. He obtained a law degree from Harvard, but even in the 1790s, it was hard for young attorneys to find work. Fortunately George Washington recognized his diplomatic talent, and selected him to be the first ambassador to Portugal and Holland, and his father made him ambassador to England. For the rest of his life he was a career civil servant and political office holder. He served as a US Senator from Massachusetts during Jefferson's Presidency, and managed to become a friend of Jefferson's despite the hostility between Jefferson and his father. When Madison became President -- perhaps sensing a rival -- he was posted as far away as possible, to the court of the Czar, from which he observed Napoleon's march across Europe and catastrophic invasion of Russia. He became the lead negotiator for the Treaty of Ghent that ended the War of 1812. Upon his return to the US, Monroe made him his Secretary of State. In that time he negotiated the Florida Accession, the US-Canadian border, and drafted the document that was promulgated as the Monroe Doctrine. Refusing to campaign, he nevertheless managed to eke out a victory via the House of Representatives in the 1824 Presidential election. Faced with a divided and later hostile Congress partial to Andrew Jackson, none of his initiatives (like comprehensive Federal funding of infrastructure improvements) came to pass, and of course he was defeated in a landslide in 1828. But in 1830 the local citizenry persuaded him to accept election as a member of the House of Representatives, where he became the relentless opponent of the expansion of slavery, successfully argued the "Armistad" case before the Supreme Court (popularized by the Steven Spielberg movie), and laid the intellectual foundation for the Emancipation Proclamation, arguing that if the South ever seceded, the President would have the right as Commander in Chief to abolish slavery in the rebellious States. He suffered a fatal stroke at his desk in the House of Representatives in 1848 as he opposed the aggressive Mexican War. He may have been the most intellectually brilliant President ever. Personally he was a goodie-two-shoes and, well, dour and prissy. But I came away from this book believing that for his lifetime of service, he deserves a prominent monument in Washington. III. "Herbert Hoover: a Life," by Glen Jeansonne. We all know about FDR. But aside from the caricature, what of the ill-fated Hoover? This is a book of two halves. Had Hoover died in 1928, he undoubtedly would have been lionized in history as a brilliant engineer and philanthropist. An orphan, he was one of the first graduates of Stanford University, with a degree in metallurgical engineering. He was a genius at locating deposits of precious and industrial metals, and also at the logistics of running a large industrial operation. The firms for which he worked earned fabulous returns, and Hoover became very wealthy even as a young man, as competitors bid for his services. By World War I, he had already retired. But when a Belgian colleague begged for his help to prevent mass starvation in the German-occupied parts of Europe, Hoover, a devout Quaker, stepped up. He applied his logistical prowess, and, mindful that neither England nor Germany wanted to be blamed for a humanitarian catastrophe, successfully played them off against one another. His operations were allowed to cross enemy lines, and he succeeded in saving literally millions of European civilians in the Benelux countries and northern France from starvation. He attended the peace negotiations in Versatile, and decried the resulting draconian Treaty, which he accurately foresaw as stoking resentment and a thirst for revenge. At the same time, facing his own dire catastrophe, Lenin allowed the capitalist Hoover to save tens of millions of Russians from starvation following the Revolution. Serving as Secretary of Commerce in the 1920s, Hoover arranged for the standardization of radio frequencies and regulations, the blueprint for allowing new tech innovations to flourish. He proposed a nationwide system of dams for water storage and the generation of electricity, many of which were ultimately constructed during the 1930s New Deal, and one of which -- Hoover Dam -- bears his name; the inter-coastal waterway project; and what became the St. Lawrence Seaway in the 1950s. During the great Mississippi floods of 1927, he again used his prodigious logistical skills to save and feed millions again,and insisted on equal treatment of both black and white victims, even in the deep South. But then we get to the second part of the book. in which the author's partisan leanings get in the way. Further, and most importantly, the section on Hoover's response to the onset of the 1929 recession is a complete mess. I had to go back and re-read the chapter twice just to organize it. The bottom line is that Hoover did react vigorously to the perfect economic storm that combined a stock market and tech meltdown similar to the 2001 recession, a big decline in housing prices and a banking crisis like that of the "Great Recession," and the incipient Dust Bowl to boot. But Hoover was always two steps behind, and his programs -- many of which Roosevelt expanded, and several of which exist to this day -- generally eased costs and were thus deflationary, exacerbating the debt deflation dynamic, rather than boosting demand in a way which would have and ultimately did under Roosevelt end deflation. And of course, the lack of a program to guarantee bank deposits was a singular failure. Hoover lived until 1964. He implacably opposed the New Deal, and as a result, although he met Hitler in the late 1930s and fully appreciated his danger, FDR sidelined him even when he offered his services after the outbreak of War. Truman did partially rehabilitate him, using his WWI template for the Marshall Plan. But we find out that Hoover was the backer of a plan to dismantle the New Deal had Truman not eked out a victory in 1948. The first half of this book is highly recommendable. The second half is highly forgettable. This is a 750 page tome that, although very readable, and thoroughly covering Wilson's presidency, ultimately misses the mark. Wilson's childhood was spent in the South before, during, and after the Civil War. Although he spent his entire adulthood in the North, he never lost that point of view. By page 75, Wilson has graduated from Princeton. By page 200, he running for governor of New Jersey in 1910. By page 300 he is President. The next 400 pages are devoted to those 8 years. Although Wilson spent a full 30 years -- more than half of his adult life -- as a Professor of History and Political Science, and later Dean -- at Princeton, this merits only 125 pages. This is a shame, because Wilson wrote a number of very prominent books on American History, and most notably on the Civil War period. He unequivocally stated his opinion that the South had the legal right to secede, but that it was good for the country that the North had won the war. It is a glaring omission from this biography that we never learn the ideology that led Wilson to this opinion, even though presumably the evidence is in plain view had Berg bothered to explore Wilson's historical writings in depth. We do learn that Wilson, as well as being a spellbinding and persuasive orator for his time (having honed his skill in the vacant pulpit of his father's church as a child), surprisingly, was quite the ladies' man, and an excellent dancer as well, with a taste for off-color limericks in his apparently ribald sense of humor that he rarely showed to the public. We also learn that intellectually, he was a complete prig, failing to see the difference between a good faith difference of opinion and a dishonest stab in the back. This brought him to a bitter end at Princeton before doing so, for largely the same reason, with the Treaty of Versailles, which, had he been willing to accept some largely inconsequential compromises and amendments, would have passed the Senate. The author does not shrink from detailing Wilson's segregation of the Washington, D.C. civil service, a huge setback for African Americans at the time, and his apparent approval of the film, "Birth of a Nation," which celebrated the origin of the KKK, both of which may have played a role in the resurgence of the KKK in the 1920s. And even the "right of self-determination" that Wilson espoused for nations proved to be for whites only, as for example Japan, not to mention Vietnam, were snubbed, and intellectually boiled down to segregation writ large on the international stage. Had the author explored the intellectual origins of Wilson's legal attachment to the Lost Cause, we would have had a much richer understanding of his policies as President.